5.303 km 58 laps by Ross Stonefeld, U.S.A. In 1956, Stirling Moss won the first Grand Prix at Albert Park, in a non-championship race run to coincide with the Olympic Games held in Australia that year. When Victoria won the rights to stage the Grand Prix for 1996, a "new" circuit was designed utilizing portions of the original track, bringing it up to modern F1 specifications. Initially, drivers and team personnel who saw the plans for the renewed circuit, predicted it to be a fast circuit with great corners, but the reality turned out to be somewhat less. However it still stands as one of the better tracks on the calendar, and the atmosphere of the venue is renowned to be matched only by Monaco's. Like Montreal and Monaco, Albert Park is used only one weekend a year. Therefore, there is a significantly low level of grip in the tarmac. The weekend starts with the track being very 'green', meaning there is lack of rubber on the surface. This is true of all tracks, but more so of the temporary circuits. There is also a problem with dust and debris off-line making the track very difficult if the car should slide. It further makes overtaking very difficult, even though there are some good spots to make an attempt. Past the start/finish line in top gear the cars accelerate under a large walkover bridge reaching close to 290 km/h before hard on the brakes for the first set of turns. 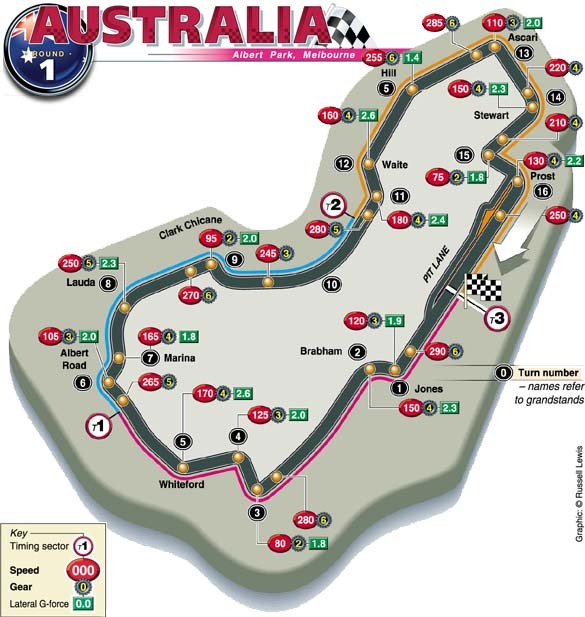 Turn 1 is a 3rd gear tight right hander taken in the area of 120 km/h. The exit of the turn 1 becomes turn 2, a long accelerating left hander where the cars will be pulling close to 2.5 gs of lateral load. Again accelerating to top speed in preparation for turn 3, scene of Martin Brundle's spectacular 1996 incident. It is a sharp right hander taken in 2nd. The drivers keep the car towards the middle of the road on the exit, and need good mechanical grip at the front end to get the car set back to the right for a good run through Turn 4, in 3rd gear across what is a car park the rest of the year. As the cars track out of Turn 4 the steering wheel is not returned to its central position yet, but lock is kept on. Again the cars must swing quickly over to the other side of the track to get ready for the 4th gear sweeper past the Whiteford grand stand. Down a shaded treelined straight and up into 5th gear. The road weaves from side to side and the cars are kept more or less straight down the middle. They pass the timing stripe as they enter the braking zone at 265 km/h. The road continues to the left slightly but the car is kept straight and level under braking for the upcoming chicane. Down into 3rd for the first right hander, then immediately up to 4th through the gentle left hander as the road snakes towards the Clark Chicane. From top speed down 4 gears they turn very late and clip the kerb before letting the car swing out and begin the long curved run towards the most critical section of the lap. The road straightens just as they cross the timing stripe for the second split and they have time to go down 1 or 2 gears before flicking the car into the first part of the complex. The elevation of the road changes during this section and the car needs a good aerodynamic balance for stability and exceptional mechanical grip is needed to help the car change direction midcorner. The entry and exit are both at the ends of long straights so how you get through this section really has an impact on your overall lap time. Out of the complex in 4th gear down another long straight, this time a gradual curve to the right. Down 3 gears and 170 km/h into a 90 degree right. Shifting up into 4th gear the drivers then approach a medium length right hander at the Stewart grand stand. A dab on the brakes to scrub some speed, turn in, apex, and apply power. As the car runs along the exit kerbing the drivers immediately bring the car back to the right to get ready for the last corner but one. Turn 15 is very much like turn 3, the drivers keeping the car tight in past the apex to get a good run through the final turn. The pit entrance is off to the right and a driver on an in lap will actually go through turn 15 faster than if he was completing a lap. The 2nd gear corner is followed by the last turn, which can be a bit tricky. The road rises just past the apex so good chassis balance is crucial to avoid spinning. They exit the corner in 4th gear and are up to 6th before the timing stripe, to start another lap down under. Melbourne is a generally smooth circuit so the cars can be run low. Top end is important for the long straight sections between corners. It is equally important to have a good set of gear ratios for optimum acceleration out of the somewhat slow chicanes. As is always the case in race car setup, a compromise is needed. Good mechanical grip at the front end and the ability to turn well while braking is fundamental for the slower corners while aerodynamic balance is most important in the Turn 11-12 section. Good braking efficiency and stability is also crucial for a quick lap at Melbourne. If you need help with car setup for your racing simulation, please visit the Atlas F1 Racing Simulators forum. This is the 16th Australian Grand Prix, the fifth in Melbourne and that will mean that it equals Monte Carlo as the fourth most common opening venue. 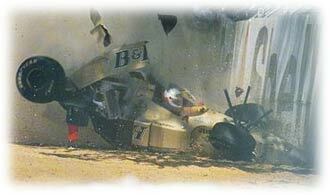 It was the 500th Grand Prix in 1990. Predecessor Adelaide was 11 times the final race of the season but only twice was the championship decided there - in 1986 when Alain Prost beat Nigel Mansell and Nelson Piquet to the title, and in 1994 when Schumacher claimed the title after bundling out Damon Hill. Australia has had 12 drivers who have started Grands Prix, but only three of those have scored points (Jack Brabham, Dave Walker and Alan Jones) of whom Brabham and Jones were winners and World Champions. 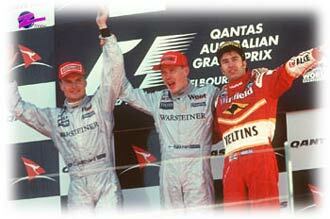 The Australian Grand Prix has been won by McLaren seven times, Williams five times, Ferrari twice and Benetton once. McLaren have had two 1-2s in Australia, while Ferrari and Williams have also had a 1-2 each. In terms of drivers, Gerhard Berger, Damon Hill, Alain Prost and Ayrton Senna have all won it twice. Senna won it from pole position each time and once flag to flag. He was on pole six times, four times in succession. Berger's win in 1987 was flag to flag from pole position with fastest lap. Hakkinen won it from pole with fastest lap in 1998. Damon Hill won the race in 1995 from pole with fastest lap by more than two laps from Olivier Panis. It was only the second time in the history of Grand Prix racing that there had been a winning margin of two laps. The 1988 Grand Prix marked the last victory by a turbo-engined car, Alain Prost's McLaren-Honda turbo. The 1998 event marked the first win for Bridgestone. The Australian races were stopped a number of times. It was stopped twice in 1989 - once at the start after two laps because of an accident and the other time at the end when rain caused the race to be shortened after two hours and 70 of the 81 laps had been run. It was also stopped in 1996, the first race at Melbourne, when Martin Brundle crashed heavily in a pile-up on the first lap. 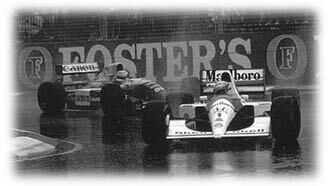 It was also famously stopped in 1991 after 14 laps because of rain. That made it the shortest Grand Prix ever in terms of distance (52.920 kms/32.883 miles) and time (24m 34.899s) but not in terms of laps because the German Grands Prix around the 22 kms Nurburgring were often shorter at 12 laps. Incidentally, in spite of those weather conditions, there were 19 classified finishers which is the equal fifth largest number of classified finishers ever. As this is the opening Grand Prix of the year, here are some statistics which you can expect to change during the coming season. For instance, Michael Schumacher is 44 points short of Ayrton Senna's career total of 614 points. Senna is second to Alain Prost in the all-time record of points, but while Schumacher could overtake Senna, he won't overtake Prost for a couple of years at least: he is 228.5s behind as we go into 2000. There is still a battle for the most points for each team with Ferrari just ahead on 2358.5 points to McLaren's 2333.5. Further back Brabham scored 854.5 points while it was active, but Benetton are just eight points behind, so could move up to fifth in the all-time standings within a few races. Holder of the all-time record for fastest laps is Alain Prost on 41 but Michael Schumacher is just two behind that on 39, so that record could well fall this year. In terms of pole positions, Ferrari have an all-time score of 127 but Lotus and Williams are equal second on 107, but they could well be overtaken during the year by McLaren with 103. Finally, in terms of wins, Ferrari have 125 but McLaren are just two behind on 123 and that will certainly change this year - but in whose favour? And while Alain Prost has ten more wins than Ayrton Senna, 51-41, which is not going to change, they could certainly be gained on by Michael Schumacher who, again, could well challenge Senna for that second placed spot in the all-time rankings. 1999 - Eddie Irvine (Britain), Ferrari. The first win of Eddie Irvine's career came after a disastrous start for his rivals after Hakkinen had set pole. The first start was aborted after the Stewarts caught fire -- Herbert missed out while Barrichello started from the pit lane in the spare car. Irvine's Ferrari team mate Michael Schumacher qualified third but started from the back of the grid after stalling before the warm-up. Both McLarens retired. 1998 - Mika Hakkinen (Finland), McLaren. McLaren started the season with a one-two finish and immediate controversy after Coulthard allowed Hakkinen past him two laps from the end. McLaren said they had agreed that whoever led at the first corner would not be challenged by the other. Hakkinen had led but was called into the pit lane due to a "misunderstanding" with his pit crew. The delay allowed Coulthard to take the lead, which he later relinquished. Another race of high drama. World champion Damon Hill, who had joined Arrows from Williams, failed to start after a throttle problem. Jacques Villeneuve, who dominated qualifying, was taken out at the first corner by Eddie Irvine's Ferrari. Villeneuve's Williams' team mate Heinz-Harald Frentzen led before spinning off with a brake problem and Coulthard gave McLaren their first victory in 50 outings since Ayrton Senna's win at Adelaide in 1993. The first outing at Albert Park since the switch from Adelaide. A Williams one-two, with Indy car champion Jacques Villeneuve making an immediate impact in his debut race by leading until engine trouble slowed him down. Ross Stonefeld © 2000 Kaizar.Com, Incorporated.